Matt Charette has been pulling off the sheetrock in Earth’s basement to reveal a hidden plumbing system that pumps water into the ocean. Rivers carry most of the rain that falls on land back to the sea. But some water percolates into underground aquifers, where water, rock, and bacteria mix and unseen chemical reactions take place. The water that went in may be different from the groundwater that emerges. It eventually flows into the coastal ocean, transporting materials that can have large impacts on marine life and the ocean’s chemistry. 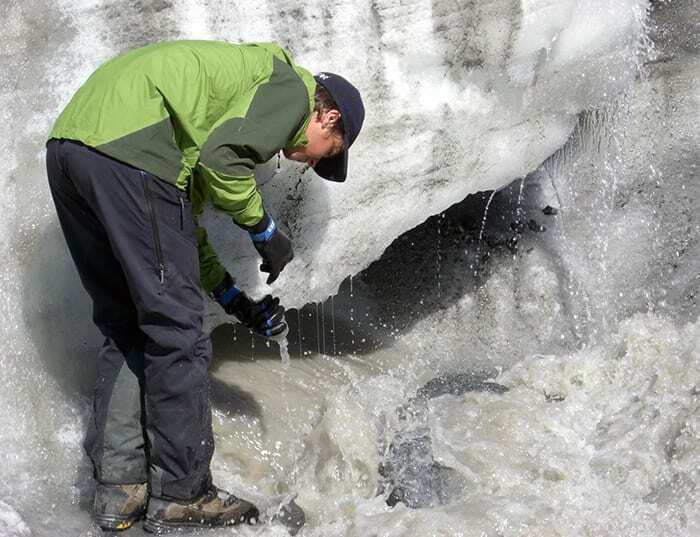 Until the new tools, how did scientists measure groundwater flow? Charette: They estimated the amount of rain falling on a watershed minus the amount of water lost via evaporation and taken up by plants. Multiplying that by the watershed area gave you some idea of how much groundwater might be leaking out at the coasts. But there’s a lot of uncertainty in that kind of calculation. Charette: Marine Chemist Billy Moore of the University of South Carolina published a study in 1996 in Nature in which he used radium isotopes to show that groundwater discharge was as important as rivers in delivering chemicals to the coastal ocean. This paper launched a new line of inquiry among ocean scientists, who began measuring very small quantities of naturally occurring radioisotopes, radium and radon, in groundwater. These are produced by the radioactive decay of uranium and thorium in the sediments within the aquifer. Relatively high levels of radium and radon are dissolved in the groundwater. But they’re at very low levels in rivers, rainfall, and other sources of freshwater to the coast. By measuring these radioisotopes in the coastal ocean, we can actually estimate how much groundwater is flowing out. Then we also measure concentrations of other trace elements to see how the groundwater is affecting ocean chemistry and marine life. Charette: Nitrogen is a main concern. It’s the essential nutrient for marine plant growth. In a lot of places, you have significant input into groundwater from fertilizers applied to agricultural fields, golf courses, and lawns, and from septic tanks. These sources combine to create pretty high concentrations of nutrients in groundwater. When that groundwater discharges, especially into poorly flushed, enclosed coastal areas, it can lead to overwhelming blooms of algae, a process called eutrophication. These blooms can block sunlight and deplete oxygen in the water, causing harm to other marine plants and fish. On the beneficial side, many marine plants and oysters require a little bit of freshwater to thrive. Without the freshwater input from groundwater, you wouldn’t have this really tasty resource. It seems that, unlike Las Vegas, what goes on in aquifers doesn’t stay there. Charette: Exactly. That’s why we examine chemical processes in coastal aquifers, because they ultimately influence the chemistry of the groundwater discharge. Those processes can be good. For example, bacteria in some aquifers can convert nitrate, a key ingredient for eutrophication, into di-nitrogen, a harmless, inert gas. Or it can be bad. We did research in Falmouth, where we found a big accumulation of iron-oxide rich sediments beneath Waquoit Bay. We called it the “iron curtain.” Arsenic, which is toxic, has a strong attraction to iron oxides. When iron oxides leach out of rocks and sediments and dissolve into groundwater, the arsenic tags along and gets into the bay. Arsenic in groundwater wells is a big problem in a lot of places, such as Bangladesh. A nice outcome of our work was that people who work on the Bangladesh problem came to Waquoit Bay to see what they can learn about that system and apply it back in Bangladesh. Another side of your research involves basic understanding of how groundwater affects the chemistry of the ocean. Charette: A classic example is that strontium has been used for decades as an indicator of how the continents have “weathered” over geological timescales. Rocks contain strontium and when they are freshly exposed to rain, some strontium is dissolved and carried off by water into the ocean. If you find a rise in strontium isotopes in ocean sediments or corals, you can correlate that to long stretches in Earth’s history when new mountains arose, for example. But that concept hasn’t fully accounted for the potential for groundwater to supply isotopic strontium to the oceans. We’ve been measuring strontium in groundwater and have some evidence that input of strontium into the ocean from groundwater isn’t negligible. And it may vary over time as sea levels rise and fall. So perhaps its effect should be accounted for when you use strontium to interpret past geological history. So beyond local areas where groundwater has big impacts, you are seeking a global perspective on the impact of groundwater. Charette: That’s right. And to get a global perspective with limited funding resources, you have to come up with a way to take a very few studies and scale them up to get the bigger picture. That’s a challenge. We targeted five types of coastline that are representative of most of the world’s coast: rocky coasts like Maine and Rhode Island, with groundwater running through fractures and fissures in bedrock; islands like Guam made of volcanic basalt; places made of calcium carbonate rock from raised-up ocean sediments or coral reefs like the Yucatan Peninsula in Mexico; and coastal plains like Cape Cod with sandy, permeable sediments consisting of quartz sands and other coarse-grained minerals. We added a separate category of ocean islands, which are a combination of basalt and carbonate from reefs. We have evidence that about one-third of all groundwater that enters oceans comes through islands. That may seem counterintuitive given their relatively small size compared to continents, but a lot of these islands are in warm, tropical environments, and as a result, they receive a lot of rainfall. Plus, their geologic structure is like Swiss cheese. They are highly permeable, and groundwater, can be transmitted quickly to the coastline. So we’ve been to a lot of places—Ireland, Greece, Guam, Patagonia, Greenland. Was traveling part of your career aspirations? Charette: I knew I wanted to travel. My dad was a freelance cameraman. He worked on the original Julia Child shows and others for PBS. He went all around the world during his career and came back with stories. That was an influence on me. Charette: In Lynn, Massachusetts, but I spent summers on Cape Cod. My parents built a house in Truro, and I would get out of the city. That was a huge influence in fostering my interests in the outdoors. And what influenced you to become a scientist? Charette: I had a fantastic chemistry teacher in high school, John Boyle. But I didn’t want to do pure lab-based chemistry. I wanted something that got me outside as well. So I found one of few undergraduate courses in oceanography—at the Florida Institute of Technology. You said groundwater research is a young science. Where is it going? Charette: We still have a lot of work to do to get a better handle on the total amount of groundwater that is discharging around the world. And we can now really begin to dig in and find connections into how groundwater inputs are affecting marine ecology. We’d also like to reconstruct how groundwater discharge patterns may have varied in the past. We’re experimenting with corals to try to do that. And we don’t have a good idea about what’s happening with groundwater in high latitudes, especially in places where permafrost and glaciers may be thawing and creating pathways for water flow that didn’t exist before. This groundwater is rich in carbon and nutrients that can have impacts on the ocean environment. This research was funded by the National Science Foundation’s Chemical Oceanography Program; the Coastal Ocean Institute and the Ocean Climate Change Institute at WHOI; and the Tropical Research Initiative and the Arctic Research Initiative at WHOI.